Vail is among the biggest ski resorts in the U.S. Aspen may well be the most famous ski town. If Vail attracts skiers and riders looking for the most terrain, then Aspen appeals to those looking for the most acclaim. We decided a comparison was in order. So in one week, our family of four diligently explored both world-renowned ski destinations to determine the cream of the Colorado ski crop. The trail maps arrived in our mailbox, so we could compare stats pre-trip. Neither of these destinations is shy on skiable acreage. 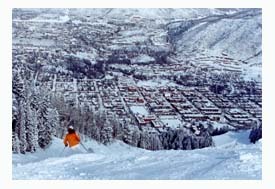 Vail alone boasts 5,289 acres and 31 lifts, once the largest single ski area in North America with two mountains and three skiable faces, but since eclipsed by Whistler, Big Sky and Park City. Aspen has four separate ski areas, conveniently represented on one multi-fold map, and the cumulative acreage is 5,517 serviced by 41 lifts. Elevation is similar at Vail and Aspen, though Aspen’s Snowmass tops out at 12,510’ where Vail’s summit is 11,570’. Still Vail gets almost 50 inches more snow annually than Aspen’s 300 inches of Colorado-style light, dry powder. 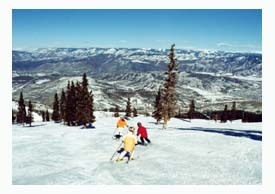 Guests at Vail can ski sister resort Beaver Creek, just 20 minutes away, on the same ticket. Vail also owns Keystone and Breckenridge, so skiers and riders have reciprocal ski benefits at these Vail Resorts too, talk about a ton of options. At Aspen, your ticket is good at the original Ajax ski area on Aspen Mountain that dates back to 1936 located in the center of town, plus nearby Aspen Highlands, Buttermilk or Snowmass, all within minutes and a free shuttle ride of each other. Aspen just purchased Intrawest ski resorts Steamboat, Copper, Stratton, Tremblant, Mammoth, and Squaw Valley/Alpine Meadows…so look for a big Aspen pass soon. Vail is 2 hours from Denver, obviously a major airline hub. Aspen is four hours from Denver. You can fly into more convenient Eagle airport near Vail or Aspen airport, which is home to more private jets than commercial planes. These are both pricey – though it might eliminate your need for a rental car. If you like to stay slopeside, both Aspen and Vail have great ski-in, ski-out towns jammed with lodging from posh hotels to condos. 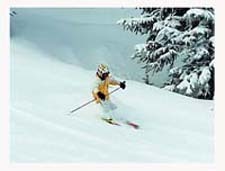 If Aspen is a funky Victorian style hub dotted with Celebs and glam shops like Prada and Chanel, then Vail is the postcard Tyrolean slopeside ski village, complete with clock tower and covered pedestrian bridge. If you are looking to be first on the slopes, Aspen offers a free “First Tracks” experience with a lift ticket. You must sign up 24 hours prior with the ski concierge (limited), then you can board the gondola at 8:00am, for fresh tracks with a guide an hour before the other paying customers. Aspen’s flagship lift, the six-passenger Silver Queen gondola, lifted us from the heart of the celebrated town to the summit of Ajax (the local’s name for Aspen) 3,267’ vertical in under 10 minutes. We really scored with seven inches of freshies on our first track morning. The early morning sun on the shimmering Aspen groves was worth getting up for, the effortless turns in the fresh powder was worth flying across the country for. At Vail, we boarded the classy 12-passenger Eagle Bahn gondola at opening bell, to experienced Vail’s variation of fresh tracks. We were among the first skiers into the legendary Back Bowls, we found seemingly endless untouched terrain. 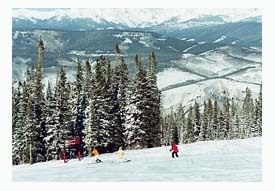 Vail’s Back Bowls, seven of them, encompass a six-mile expanse of wide-open, above tree line “ski anywhere you like” beauty. If its steep you long for, Aspen Highlands has the expert reputation of Aspen’s foursome. This is where the local powder hounds ski. The steep mountain has some of the best inbounds extreme skiing in North America. It’s lift-serviced backcountry terrain, a delightful oxymoron. 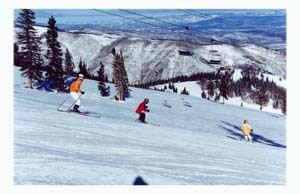 Vail’s sister resort, Beaver Creek has “chase your spit” steep runs including the heralded Golden Eagle Downhill course on the Birds of Prey area. Beaver Creek’s Centennial lift gave us plenty of bang for our buck, launching from gorgeous base village (started in 1980) up 2,000’ vertical in eight quick minutes. From here we explored meticulously groomed steep pitches on the front face, and fantastic glade shots, with a quick pass through the fun kids’ Zoom Room and Rowdy Ridge. Our record vertical day at Beaver Creek, 34,200’, we boarded all six high-speed quads for run after run on the 1,600 acres of terrain. We concluded Beaver Creek has the most consistent fall line skiing of any we experienced. If you like scenic cruisers, Snowmass has what I consider the most heavenly skiing on the planet. The Big Burn is named for the forest fire damage that cleared all but a sprinkling of towering pines on the perfectly sloped mountaintop. Riding the speedy quad, we threaded infinite turns while admiring namesake Snowmass Mountain in the distance. Snowmass is Aspen’s biggest, and we deemed it the best of the four pack. 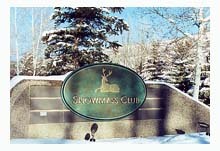 The name alone implies the size, with 3,332 skiable acres, this beautiful resort is massive, with the most vertical of any single US resort, (yes more than Vail’s 3,450’), at 4,406’. Snowmass has seven high-speed quads and tons of terrain for everyone. The Long Shot was our most unique run here; a 10 minute climb (not for everyone) leads you to a 3.7-mile adventure – that feels more out-a-bounds than in. Last of Aspen’s mountains is Buttermilk, which was hosting the X-Games during our visit. This is the smallest and tamest, a great spot for beginners and kids. We skipped over Buttermilk because it was heavily populated with gen-Xers for the big event. 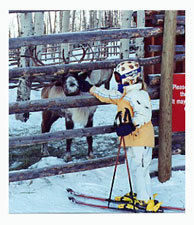 Not to be outdone, Vail has skiing and riding for everyone. The Back Bowls offer a few daily groomed runs in the sunshine, or the dumping snow depending upon your timing. If that’s not enough, there’s Blue Sky Basin and Pete’s Bowl, a third mountain face added in 2000, which is adventure skiing on uniquely groomed glade runs. Vail’s Front Side has tons of traditional trails from beginner to bumps – served by quads galore. 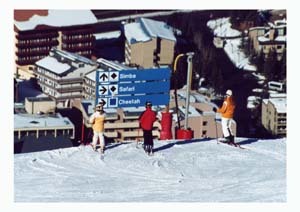 Vail’s vast lift system is incredible, as are the lift status signs at each peak indicating any lift lines so that you can avoid the crowds. Vail is busy, the word is out, but with all this terrain, so check the Epic Mix app for list line wait times, and go to Western Game Creek Bowl early or the Born Free safari trails in the afternoon. As you descend Riva Ridge, named for Vail’s 1962 founder Pete Seibert’s service in the 10th Mountain Division head for the beautiful namesake 10th Mountain Lodge for lunch or a beverage at the gorgeous bar. Descending Aspen’s ski runs, which funnel to a narrow gully, you look down on the quaint turned swank town. Ski Ruthie’s to the American Downhill course or shop Prada and the oodles of chi-chi designer shops – that was our conundrum – so we opted for both! Aspen is where you go to see and be seen. The best oxymoron we uncovered is that so few Aspenites actually ski. This makes for fantastic un-crowded skiing and admittedly great star spotting. Curl up by the roaring fire in couches at The Limelight Hotel’s Lobby Bar, the place for après ski, and watch the parade of furs and cowboy boots. At the St Regis, we had a drink with comedian Carrot top and apparently just missed Melanie Griffith. Our First Tracks ski instructor lives next to the “Dons,” Henley and Johnson. That’s all the Aspen name-dropping I have for you. Unlike Aspen’s glitzy après ski scene, Vail skiers and riders go directly to the bars and pubs that line the downtown in their ski boots – a slightly more hard-core crowd. Vail appears the more rowdy of the alpine hamlets, but I cannot fairly attest to which town has better nightlife. After all the skiing we did, the pillow won. And while Aspen was hosting the X-Games, Vail had the US Freeskiing Championships in town. Suffice it to say you will not go thirsty, hungry or un-amused after the lifts close in either of these animated ski towns. Out west, they do things big and the on-mountain lodges are no exception. The nicest mid-mountain lodge is Spruce Saddle at Beaver Creek, with panoramic views of the Rockies outside and a wildlife décor inside. 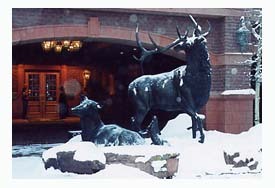 Vail’s mountaintop Two Elk Lodge is also a must stop. 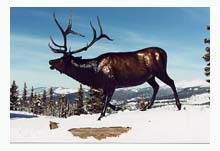 This monumental post and beam centerpiece lodge offers very good fare cafeteria stylewith outstanding panoramas. Aspen’s Sun Lodge is an award-winning lodge, for its enviro-friendly aspect. It may be made from green materials – but this lodge at the top of the gondola is fantastic inside and out, including views of the famous Maroon Bells. Snowmass got the nod from our eight and nine year old for printing a kids’ trail map. Snowmass is the family oriented area of Aspen’s four, and our kids loved cruising the mountain’s adventure zones, skiing through an Indian village, and even petting live reindeer on Rudolph’s Run by following their trail map, just like Dad’s only more fun. Vail has plenty of cool kids terrain including Chaos Canyon and Fort Whippersnapper- a terrific on-mountain model miner’s fort. 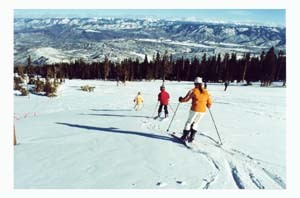 Adventure Ridge gives families an evening entertainment zone with tubing, snowmobiling and laser tag reached by gondola. In one week we did the side-by-side ski test of Aspen and Vail, to determine who is the fairest of them all. End result, we were exhausted from logging 234,000 vertical – but gleeful. 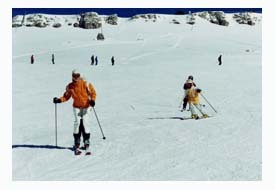 We came to ski and we were highly successful, quite high literally too, skiing at elevations over 10,000’. Aspen’s four diverse mountains and fabulous ski town will amuse anyone for days, weeks, and for many -a lifetime. 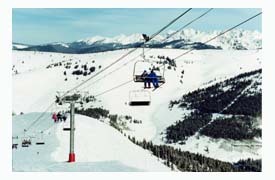 Vail alone takes a week to conquer plus you have Beaver Creek, Breckenridge, Keystone and Arapahoe on the same ticket. I recommend you bring the pace down a notch, settle in to one of these incredible resorts and stay awhile. Pick the Colorado ski resort that suits your personality. If you long for maximum vertical, neither area will disappoint.